Is plan to be prepared in Imperial or Metric? What scale will you require? Is there a minimum text size required? Some clients produce their drawings in one scale but need reductions for reasons that aren’t important. This usually means that text should not drop below L080. Our drawings could then be reduced by as much as 50% and all text would still be legible. Do you wish to have the final plot aligned on the plot media with a particular rotation. Would you prefer line work broken around text? Would you like the drawings layers to be transformed to your CAD standards? Is there a tool for converting AutoCAD drawing versions? Yes. DWG TrueView CAD file conversion software includes DWG TrueConvert™ translation software for translating any AutoCAD design application or AutoCAD-based drawing file for compatibility. I found a property bar on my corner. Is there any way of telling what surveyor planted the bar? All survey bars should have the surveyor’s registration number stamped on one face and near the top of the bar. Shown below is a list of the more common registration numbers found in the area of Essex County. 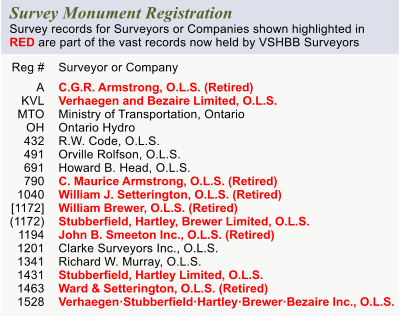 If you find a number on a survey bar that’s not on this list and would like to know the surveyor who set it please contact us at 519-258-1772 and we’d be pleased to look the number up for you. If you have a question that is no on our list of Frequently Asked Questions, please contact us and we will be happy to assist you.